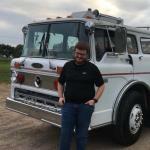 I am looking to have my recently purchased 1985 Ford C8000 Pumper re-painted here locally in the DFW area and was wondering if anyone else had a shop they could recommend. There are some small spots of surface rust I would also want to deal with. Alternatively we are looking at vinyl wraps if they would be cheaper but the idea of actually repainting the rig sits better with me if I can stomach the cost.